If you are running a business, you will be in need to get the products for your business in bulk. You are required to place the order to the seller so that he can send you all the products in bulk. Sometimes, the seller sends the ordered goods in multiple shipments. The part of the order that has not yet been received by other shipment is known as back order. If you don’t want to receive the back ordered goods for any reason, you are required to send a notice to the seller so that he will cancel the shipment. Sending the notice to the supplier is one of the most effective and professional ways to cancel the order. When to write the notice to cancel the back ordered goods? When your warehouse no longer needs the back ordered goods. Since you have not received a part of the order, the billing details of the order will have to be changed. For this, the notice should state and request the supplier to make adjustments in the invoice. After this notice, you will have to pay only for the shipment that you have received. If you have already paid the money for all the goods, then you can demand the refund. The notice should be written in a formal and professional way. 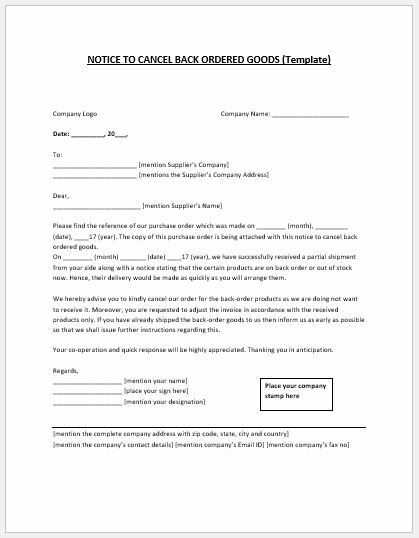 The form should include the name of the company on behalf of which, you are writing this notice. The title of the notice, company’s logo, the date on which the notice is being written, the name of the supplier, name of supplier’s company and a proper salutation should be mentioned at the top of the notice. Please find the reference to our purchase order which was made on [DATE]. The copy of this purchase order is being attached to this notice to cancel back ordered goods. On [DATE], we have successfully received a partial shipment from your side along with a notice stating that the certain products are on back order or out of stock now. Hence, their delivery would be made as quickly as you will arrange them. We hereby advise you to kindly cancel the order for the back-order products as we are do not want to receive it. Moreover, you are requested to adjust the invoice in accordance with the received products only. If you have already shipped the back-order goods to us then inform us as early as possible so that we shall issue further instructions regarding this. Your co-operation and quick response will be highly appreciated. Thanking you in anticipation.